Patient boarding - holding admitted patients in the Emergency Department (ED) rather than transferring them to other inpatient units - is a tactic used by many EDs struggling to cope with high demand. A recent survey conducted by Studer Group reviewed the extent of patient boarding across the United States, and examined the impact of boarding on patient experience, quality of care, patient safety, and ED staff and physician engagement. This Insight introduces highlights from the survey, along with some of the most effective tactics for reducing patient boarding. Patient boarding has become a common practice, and overcrowding in EDs threatens public health by compromising patient safety and jeopardizing the reliability of the emergency care system. Patient boarding negatively impacts patients' ED satisfaction ratings and overall hospital satisfaction ratings. 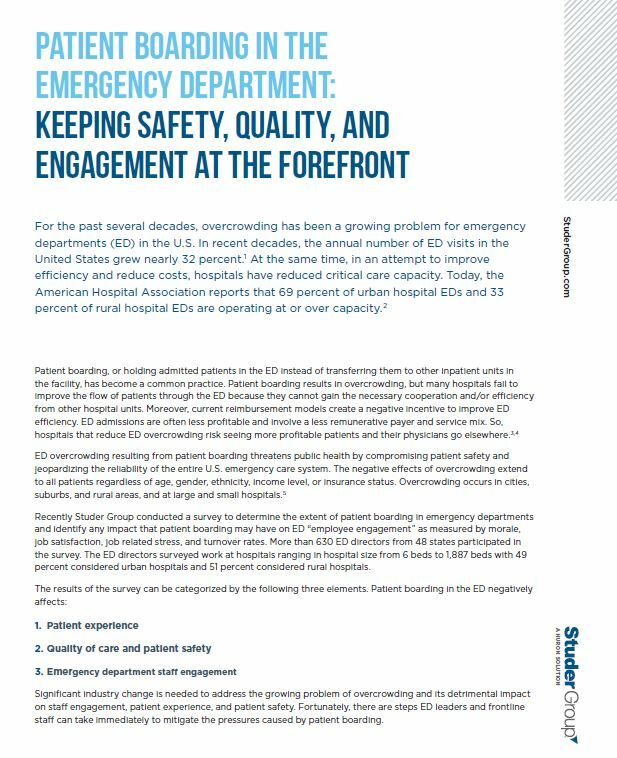 To view more detailed results from the research study and survey, download the complete Studer Group Emergency Department Study. Process: Start by aligning organizational goals across departments. Then begin working through the entire admit-to-discharge process to identify opportunities to decrease patient boarding. This can be led by a hospital throughput committee composed of cross-departmental stakeholders. Bed huddles bring together inpatient unit leaders, hospitalists, case managers, and other staff to verify confirmed discharge and anticipated discharge patients. Leverage data to forecast anticipated volumes of admitted and discharged patients, so staff can be proactive and ready to receive patients rather than reactive to crisis situations. Use ED occupancy surge plans to map out action plans and required responses for each department when the ED reaches a saturation point. Patients: Effective and timely communication helps manage patient perceptions of care during times of patient boarding. AIDET® (Acknowledge, Introduce, Duration, Explanation, and Thank You) is a communication framework that reduces patient anxiety and builds trust in providers. Different components are emphasized at different times - regular updates on Duration are typically the most critical component for boarded patients. Another key tactic is rounding on patients by inpatient nurse leaders. Rounding gives leaders the opportunity to express empathy, to thank patients for waiting for an inpatient bed, to reassure patients and families that the team is working to solve the problem, and to provide updates on bed availability. People: A major source of dissatisfaction for employees is experiencing reoccurring problems with no solutions or plans for change offered by leaders. Leaders can learn about barriers by rounding on ED staff. It is imperative to follow up on commitments and work to remove barriers. If requirements for additional equipment or staff are identified, consider using an area that is open at designated times for overflow patients. Bring in Med/Surg, Tele or ICU nurses to assist with managing admitted patients. Engagement will improve when ED employees have the right environment to do their best work. For information about specialized Canadian ED coaching partnerships or ED assessments, contact Ashley.chisholm@studergroup.com. For additional tools, articles and whitepapers, go online to Studer Group Canada's complimentary healthcare resources page. [ii] "Taking the Pulse: The State of America's Hospitals," American Heart Association. Available at: http://www.aha.org/aha/content/2005/pdf/TakingthePulse.pdf.